As you can see we are under a blanket of snow at Hedgehog Hill. 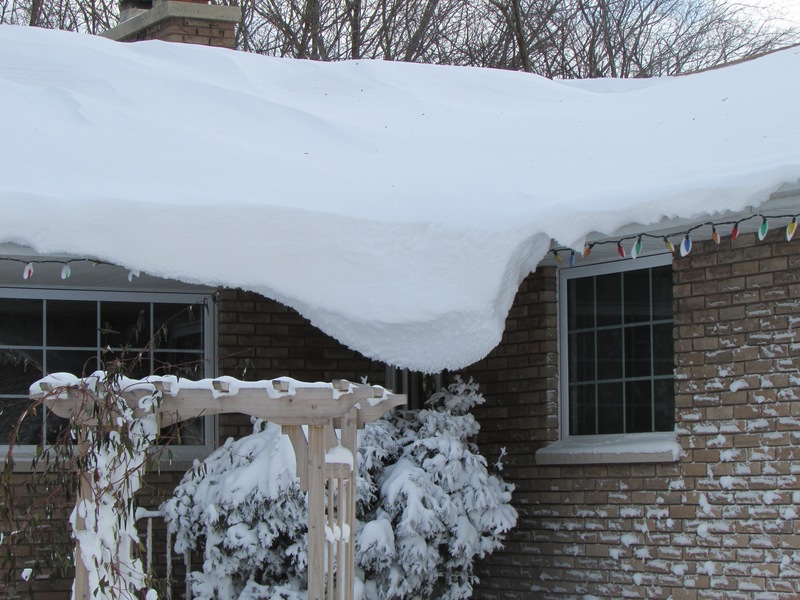 We had a green Christmas and New Years then a week of streamers off the lake that swirled around the house and yard. This means long dark nights and bitter cold days. 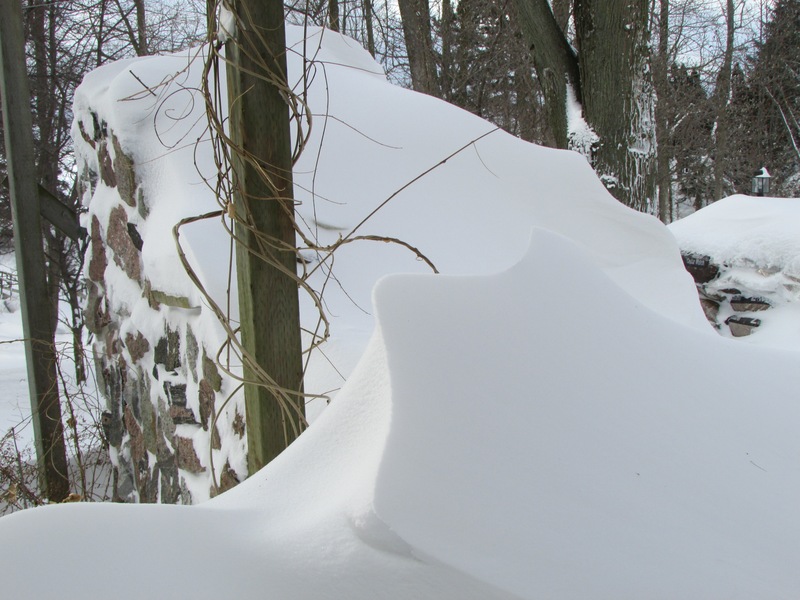 When it has been nice enough to venture outside I caught a few images of the drifts. 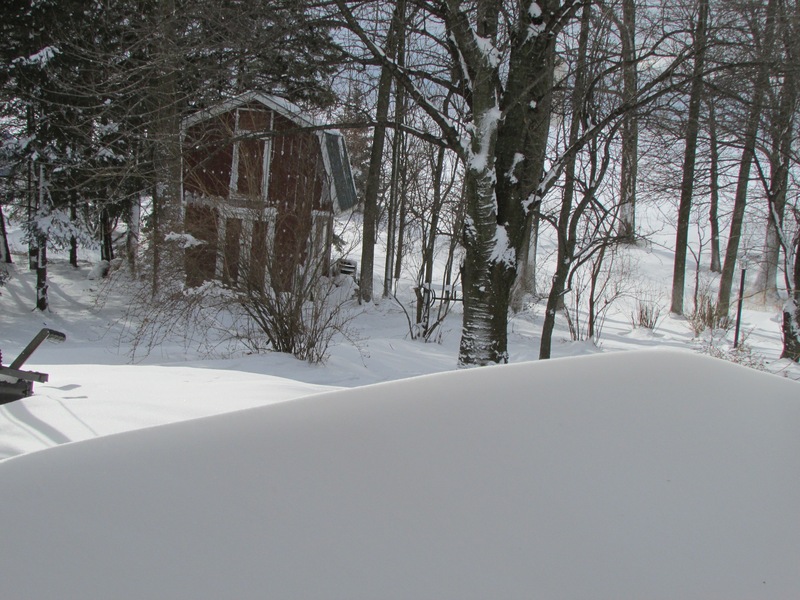 Snow is so hard to capture in a photo, it remains stubbornly flat and one-dimensional. Yet I marvel at all of the shapes and drifts it forms. The overhang in the first picture has continued to grow for over a week, how does it just hang there? The winds have been fierce at times. Earlier today I was dreaming of warmer times in the garden and remembered that I still have a lot of lovely produce frozen that should get used up before the next harvest. Maybe it was all the swirling, but I got to thinking about a layer of sweet black raspberries in a golden, rich cake. See the resemblance? Is it piles of cake and drifts of raspberries? Or is it lashings of sweetness between crumbly goodness? I posted a picture on Instagram (you can link to my account over on the side bar or simply search for Mrs Murfin) and someone – @katkommentary asked for the recipe. It is a bt long for instagram so I decided to finally dust off the blog again. On a side note I was happy to find I could drag and drop photos….has that option always been there??? Back to the recipe. Since I did not plan ahead I don’t have cake-in-progress photos so you will have to just read about it. First I took a healthy cup – a cup and a half of frozen black raspberries from the freezer. 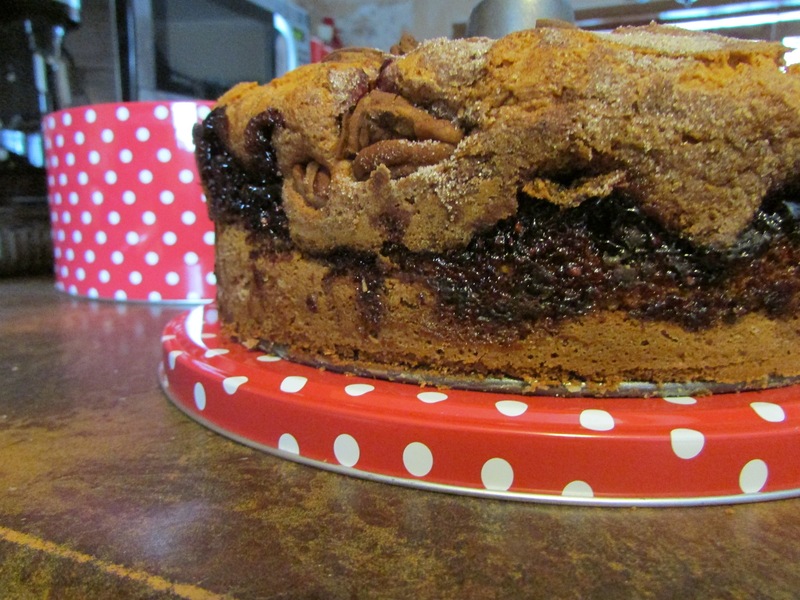 Any fruit will do really, or you can make the same coffee cake with just nuts and cinnamon. I put the berries in a pot with about half a cup of white sugar and a teaspoon and a half of cornstarch. I mixed them together and put them on a medium heat, melting the sugar in and thickening as they came to a gentle boil. I turned them down and let the mix bubble for a few minutes until they were a runny jam consistency. I took them off the heat to cool. Pre-heat your oven to 350 F.
I make this cake in a ring pan, but there is no reason you can’t make it in a 9 X 13″ cake pan. It rises quite a bit so make sure whatever pan you use has room for it. I do grease and flour the pan…I hate it when things stick. Meanwhile I made my favourite sour cream coffee cake batter. I have a real phobia about running out of sour cream at Christmas. Something about having guests in the house, I MUST have sour cream! Never mind that I am the only one who eats it most of the time. Anyway I somehow ended up with 3 – yes 3 – tubs in the fridge. This is a great way to use up the end of the tub. (I did throw out one tub that was fresh dated to last September…..yikes!) So measure out 1 cup of sour cream and set aside. Cream 1/2 cup of soft butter with 1 cup of white sugar and 2 eggs with a mixer. In a separate bowl combine 2 cups of all-purpose flour, 1 tsp baking soda, 1 tsp baking powder, and a 1/4 tsp of salt. Mix the dry ingredients into the butter mixture alternately with the cup of sour cream. This is where a stand mixer is really nice, or help in the kitchen because other wise you need three hands. I like to give it a good beating so it gets nice and fluffy,and thick. Pour half of the batter into the prepared pan and spread around. It doesn’t look like there is enough, but there is. It will rise and bulk up so don’t panic, just spread it out. 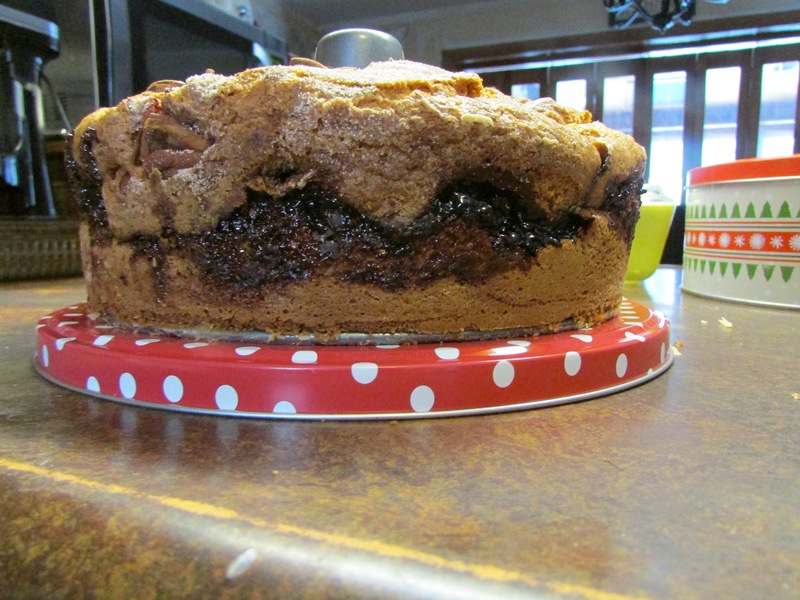 If you are making a plain cinnamon nut coffee cake you can sprinkle half of it over the batter now. For that I mix 1/4 cup of white sugar, 1/4 cup of chopped nuts (walnuts or pecans), and 1 1/2 tsp cinnamon. I decide to add that today along with the raspberries but it could be optional. Pour the cooled raspberries over the batter and spread a little gently with a spoon. Drop spoonfuls of the remaining batter over the top and spread as best you can. Again it will spread as it bakes. Sprinkle the top with the remaining sugar and nut mixture. Bake at 350 F for 35 – 45 minutes. You really have to do a poke test to see if there is any goopy batter before you pull it out. I think I will make some Birds custard tomorrow to pour over and make it even more decadent.